You’re on the move. Perhaps you’re at a music festival and spot a well-known musician in the crowd, or you might be at a convention and find Tom Cruise is wandering around dresssed as a Stormtrooper (like that would happen). What you really want to do is grab a few moments with these guys, record the chat and publish it as a podcast. But you didn’t bring your laptop, Blue Snowball iCE microphone (CA/UK), headphones, or posse. In fact, you’re totally unprepared for the situation. Instead of whipping out your smartphone for a selfie and self-congratulatory (if consolation) tweet, why not use the slab of highly sophisticated metals and plastics in your pocket for a more creative purpose… like making a podcast? 1. You Forgot Your Phone Had a Mic? I’ve been podcasting since 2007, but for the past 12 months I’ve been working with a local community radio station. While scheduled location interviews are conducted using a broadcast-standard portable mic with flash storage, presenters are encouraged to install voice-recording apps on their phones and use these whenever an opportunity arises to chat with someone whose thoughts might be considered worthy of airtime. These same apps can also be used for podcasting! As long as you can save the audio in a usable format (typically M4A, WAV, or MP3 The 10 Most Common Audio Formats: Which One Should You Use? The 10 Most Common Audio Formats: Which One Should You Use? You know about MP3, but what about AAC, FLAC, OGG, or WMA? Why do so many audio file formats exist? Here's a breakdown. Read More ), then you can export it to the software you usually employ for your podcast editing. Typically, this will be Audioboom (on Windows and Linux) or Garageband (on Mac). You might even use Adobe Audition. Apps you can use to record audio include the typical note-taking apps like OneNote, Google Keep, Evernote, etc, which are available on both iOS and Android (and if you’re lucky, on Windows 10 Mobile). Meanwhile, if you find yourself in a group situation and can’t move your phone quickly enough to record everyone as they chat, get the group to record themselves, then upload the audio to the cloud or use NFC 4 Best Apps for Sharing Large Files Instantly 4 Best Apps for Sharing Large Files Instantly With these apps, sharing large files with someone in a split second will be the easiest thing you've ever done. 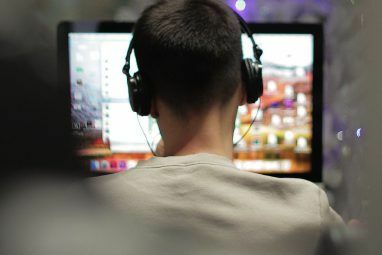 Read More or other methods The 15 Best Ways to Share Files With Anyone Over the Web The 15 Best Ways to Share Files With Anyone Over the Web There are many ways to share files between people and devices. With these 15 tools, you can share files quickly without app downloads, account registrations, or any cloud storage setups. Read More to bounce the audio to your device when you’re all done. You’re out in public and there’s a possibility that you might meet someone who’ll agree to being interviewed for a podcast. There are, generally speaking, two ways in which this might happen. The first is as described in the introduction: the event you’re at features interesting people who you want to find more about, then share this with your audience. It doesn’t matter whether it’s a comic book writer or Slash — as long as they agree, open the app, record, and make sure you keep the mic near them when they speak. You might also bump into people at a social event. Perhaps your sister’s best friend is dating the star quarterback, or the prospective candidate goes to your mom’s church. Keeping your phone charged, the recording app shortcut on your home screen, and plenty of space on your phone are all very important. However, so is being friendly, courteous, and having the right questions to ask. And if you can’t think of any questions, at the very least be ready to prompt the interview subject. Oh, and look interested too! Mobile battery pack — Ridiculously affordable these days. Once charged, one of these can provide two to four charges for a smartphone or a single charge for a tablet. Alternative recording device — Not ideal, but should you be concerned about your phone’s charge and not have a power outlet nearby, having an alternative recorder is a wise option. External microphone — There are situations where this might prove useful, such as recording a group of people talking. With the right mic selection, of course. Alternatively, read on for alternatives. You might be able to think of further hardware, but this is what I carry, just in case. Not all mobile podcasting is likely to occur in person. Therefore, you can use your smartphone to call up subjects and interview them wherever you are. As long as you have a phone that supports call recording software and have agreed with the interview subject to record the call (they’d be pretty sadistic to make you write everything down, but it has been known) then you’ll have some usable material to edit into a podcast, or even use as the podcast itself. To record a phone call, you’ll need a suitable app as the ability isn’t available by default. For Android users, we’ve previously rounded up a good collection of call recording tools How to Record Only Your Important Phone Calls on Android How to Record Only Your Important Phone Calls on Android Phone call recordings can come in handy in a number of ways - for example, saving a phone call interview so you can go back and transcribe it at a later time. Phone call recordings... Read More that continue to be relevant, and call recording apps are also available for iOS. Meanwhile, if you’re making your calls via Skype, the same apps should record this service, as well as calls over Google Hangouts, Viber, ooVoo, and other Skype alternatives Cut the Cord With 4 VoIP Phone Plans That Are Cheaper Than Skype Cut the Cord With 4 VoIP Phone Plans That Are Cheaper Than Skype Cost-cutting is all the rage at the moment. In this article, we show you how four VoIP cheap alternatives could help slash your telecommunications bill. Read More . 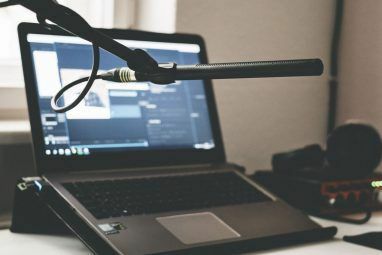 Some of the suggestions for running a podcast from your smartphone or tablet that we’ve looked at so far sort of leave the idea of creating a polished final product by the wayside. But if you desperately need to cut and tidy a recording before you publish it, various audio editing tools are at your disposal. On Android, Lexis Audio Editor is a strong option for trimming and cutting audio, and also offers fades, silence, noise reduction and more. Although it will export in many formats, you’ll need to upgrade (in-app purchase) to export in MP3. For iOS, TwistedWave Audio Editor is probably the best option, available from iTunes for $9.99. Meanwhile, you might also find some podcasting apps that feature editing tools (see below). On a similar note, you should make sure that any audio files that are vital to the production of your podcast are easily accessible. This might mean storing them on your phone, or syncing the files to the cloud. Well, if you’re engaging in some mobile editing before uploading the file, you might decide to go the whole hog and edit together a full desktop-style podcast, complete with your usual opening (perhaps a theme tune, voice over, that sort of thing) and any inter-podcast audio separators you employ to indicate a change of topic. As long as these things are easy to grab hold of, you can import them into your mobile podcast! Various podcasting applications are available that come with recording and basic editing tools to create a file that is ready for upload. You might also find a tool that has the capability for live broadcast, such as the Spreaker app! Audioboom — Allows you to listen to podcasts as well as upload your own. Soundcloud — Again, you can use this app to upload podcasts to your space or listen to others. 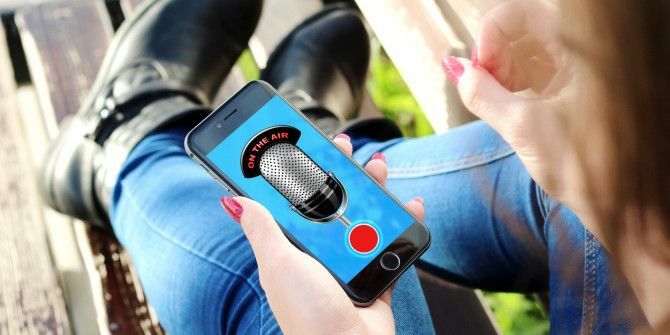 Spreaker Studio — Available for smartphone and tablet, this offers a more studio-esque environment and upload capabilities. 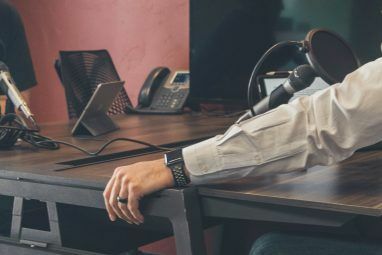 For more on these apps, take a look at my guide for starting your own successful podcast How To Start Your Own Successful Podcast How To Start Your Own Successful Podcast Podcasts can be heard by millions of people worldwide. Now it's easier than ever to collaborate, record, edit, publish, and promote your own show. We show you how. Read More . Do you use your smartphone to record your podcasts, collecting chats and publishing them via Spreaker, Soundcloud or Audioboom as you travel, road warrior style? Or do you prefer a PC and a copy of Skype? Use the comments to tell us your mobile podcasting story! You need to be able to monotir what you are recording. Buy a small adaptor into which you can plug an external mic and headphones/earbuds. If you don't have a mic, remember, the phone's mics are at the bottom, not the top of the phone.